Modern townhouse with ground floor sunny patio, quiet but central location near tennis centre. Community pool & gardens, FREE wifi. La Hacienda del Golf, in a great central yet set-back location in La Manga Club Resort, is a community of modern semi-detached villas, townhouses and apartments, built in a Spanish style with extensive level lawned community gardens and a large freeform pool with children’s pool section. 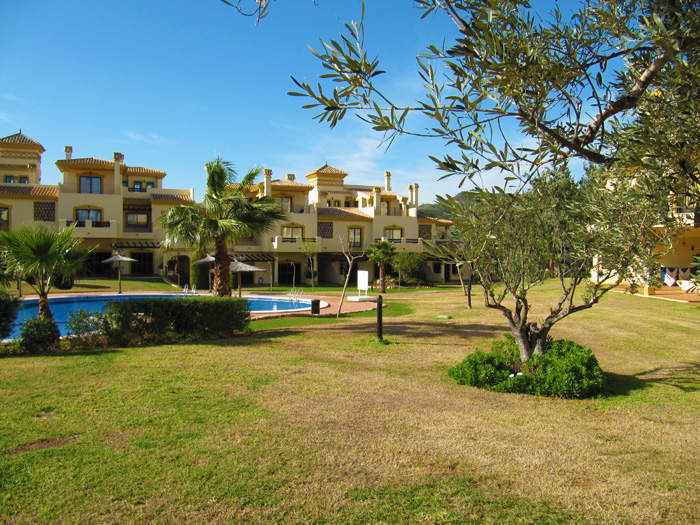 This beautiful modern townhouse at La Hacienda Del Golf is an exceptionally large 3 bedroom, 2 bathroom townhouse on ground and first floors, with high ceilings and furnished and equipped to the highest specification. 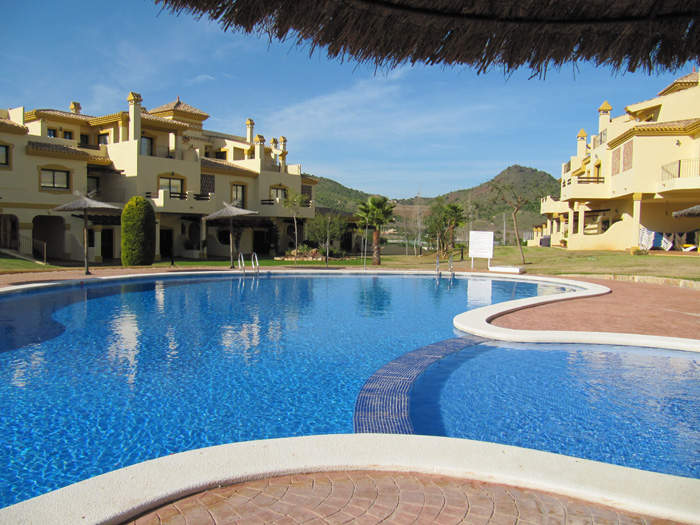 With two south facing sunny patios and direct access to the community grounds and large pool, it is the ideal base for you to enjoy your time at the magnificent La Manga Club. There is free wifi internet access. Large lounge with patio doors leading to private terrace and community pool. 32″ Flat Screen TV. Satellite TV including UK terrestrial, Sky Sports, Sky Movies and many more, DVD / PS2 with games, TV hard-drive recorder, Hi-Fi, iPod docking/charging station, telephone for making free calls within the Resort. Selection of board games and books. Raised dining area with seating for eight. Fully equipped kitchen with separate utility room, including oven, hob, extractor fan, fridge freezer, microwave, Krups “Dolce Gusto” coffee maker, dishwasher, washing machine and tumble dryer. Master bedroom with 6′ double and patio doors leading to private patio, with separate dressing room and ensuite bathroom with twin sinks, bath and separate shower enclosure. Hairdryer. Curling Tongs. On the first floor are two further spacious twin bedrooms (3′ beds) on first floor, each with patio doors leading to enclosed south facing large terrace. Hairdryer. Family bathroom, twin sinks, bath and separate shower enclosure. 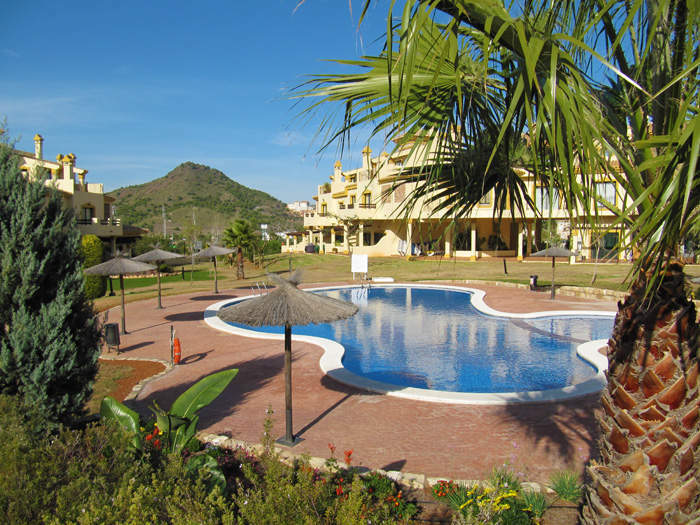 Central but peaceful location in La Manga Club Resort, air conditioning throughout. Private terrace with outdoor dining and gas barbeque facilities. Large freeform community pool and level lawned community gardens. All bedrooms can be configured as king size or twin beds. Professionally managed in the resort, the keys to the property can be collected 24 hours a day. Prices include linen, towels and a grocery welcome pack. MINIMUM RATE 4 NIGHTS – FOR BOOKINGS OF 5 NIGHTS OR LESS A NIGHTLY RATE APPLIES: LOW SEASON £180.00 PER NIGHT / MID SEASON £220.00 PER NIGHT / HIGH SEASON (MINIMUM 7 NIGHTS IN HIGH SEASON). Saturday to Saturday rentals preferred in July, August and other popular periods, although other stays are considered, please enquire. While every effort is taken to ensure these details are accurate, property description and facilities are subject to change without notice. Cream Resorts and Rent La Manga Club cannot be held responsible for their accuracy.